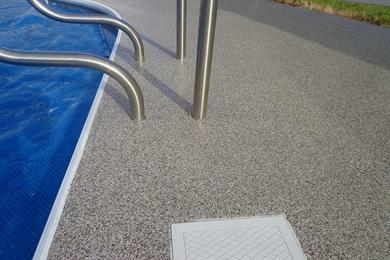 The Graniflex Decorative Broadcasting System is a permanent, flexible, and decorative coating system. 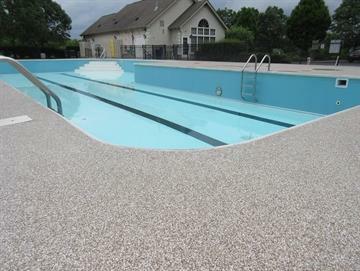 Protecting the application pool-graniflexsurface with the Sani-Tred products and decorating with polymer flakes, quartz, or sand, the Graniflex System delivers a durable high performance coating that is slip resistant and crack proof. With unlimited color options, the Graniflex color flake or quartz decorative broadcast system excels where other broadcast systems cannot. Epoxy or polyaspartic systems simply do not work for extended periods of time on exterior applications and often fail because they can’t hold back the vapor pressure exerted on them in an outdoor setting. The same thing goes for many floors or other areas where moisture vapor pressure is an issue. Graniflex is a flexible rubber “tentacle-like fingers” penetrate deep (sometimes up to 1.5 inches deep) within prepared concrete…when moisture vapor/pressure presses against them they expand and swell tightly against the concrete capillaries making it impossible to blow off the coating! Flexible Penetration®. Graniflex penetrates deeply into the pores of the building materials, then cures as tough as a truck tire therefore it is impossible for it to ever bubble, peel or delaminate. The flexible penetration allows Graniflex to hold back extreme negative hydrostatic pressure without failure! Elongation Memory® technology ensures that when Graniflex is compressed and relaxed, it maintains its original shape and size preventing distortion of it’s original shape and size which is a major cause of release of coatings from powerful forces such as freeze/thaw cycles, water or gas pressure, vibration and sudden shock. Permanent Elongation® Graniflex is capable of an amazing 590% elongation, and never hardens or become brittle. It maintains flexibility and becomes stronger with age without breaking down as other coatings do. Graniflex deeply penetrates and strengthens weak concrete or mortar joints which prevent detachment from these types of weak substrates as other coatings are known to do.